5 out of 5 stars! Our family enjoyed our tour with Sara. She was very knowledgeable and truly enhanced our experience. Her maps and descriptions helped bring the Valley of the Temples alive for us. Definitely recommend! Sara was an amazing guide!! Despite challenges we had with our daughter she managed to adapt to our needs Thank you Sara! Our guide, Sara, met us right on time as we changed the meeting location at the last minute. She was very responsive to our emails/texts. As a guide she was extremely knowledgeable and personable. Her English was excellent. She went beyond her guiding service to help us find a parking spot and how to pay. Sara was wonderful. Knows her stuff. Also arranged a spectacular lunch for my wife and I at Villa Athena overlooking the Concordia Temple as it was my wife's 55th birthday. Highly recommend. Sara (our guide) was very accomodating- we were well over an hour late, although we kept in touch. However, it was a very hot day and truth be told... after having been to Athens acropolis three times, Crete, Epheseus and Delphi and other ancient Greek and Roman sites... Agrigento was not as impressive as I had hoped ! Perhaps we should have been there very early in the morning when it might have been cooler, and really explored everything including the gardens - which are said to be beautiful. Sara was an excellent guide for our tour. Her knowledge of the sites was extensive and her friendly manner was enjoyable. She also carried with her diagrams of what the ancient floor plans of the temples would have looked like, which helped us to imagine what the temples were like when they were built. Thank you Sara. Very informative tour and Sara was very patient waiting for us when the bus failed to drop us off! Sara was extremely knowledgeable about the Valley of the Temples. It was a great tour. Sara was a lovely person and made the meeting to start the tour very convenient. She knew her history and had lots of Interesting facts to share. Personally I felt the tour was too long and not full of energy but it could have been tiredness on my part. TOUR GUIDE RESPONSE: Dear Laura Actually the walking gets longer when il starts from the private access of Villa Athena Hotel. But having no car there is no other possibility. But this avoids customers driving parking and queue at the regular entrance. This is why many customers choose staying in Villa Athena Hotel ***** and I consent with their choice. Saluti Travelers Do not hesitate to experience a truly inspiring presentation with Sara. Her detailed knowledge, native Sicilian passion and local perspective make for an intimate tour well worth the price. A presto! We enjoyed our tour with Sara. She was clear. Her English was perfect. She gave us the highlights and moved the tour along perfectly. I would certainly use her again! Informative and interesting not only on Valley of the Temples, also on local Sicilian life and Mediterranean archeological insight. Sara provided us with a great overview of this unique archaelogical site which we would have never been able to grasp on our own. Many books provide the information that Sara shared however the time is spent looking down at the book instead of looking up ! Sara provided us with a great overview of Girgenti and areas of the community which we would have surely missed otherwise. As a long-time resident of the community, Sara provided an informative and interested perspective of the then and now events that shape the changing dynamics of the city. Sara met us promptly at the agreed time and provided us with an EXCELLENT experience! She was exceptionally knowledgeable and prepared with illustrations and enlightening facts. She adjusted her pace to meet our needs and answered every one of our questions thoroughly, and so much more. We got so much more out of our visit than we would have on our own. We highly recommend Sara as a terrific guide! We had a great time with Sara. She was extremely knowlegable and personable. She didn't rush us through the tour and gave us additional information about the surrounding area. She even called a restaurant she recommended for reservations (and the restaurant was fantastic). We really couldn't have been happier. Great tour. You can't go wrong. Very interesting, enjoyed the tour, and learned so much. Would highly recommend. Sara was fantastic. Her knowledge of the area, the history and the archaeology of the site was exemplary. We enjoyed our morning with her and learned a lot from her. Our 11 yr old grandson was with us and he really enjoyed the tour as well. Sara engaged us all and was very good with keeping the tour on track and interesting. We would highly recommend her and Tours by Locals to all our traveling friends. Sara is expert on the site and had good visual materials (e.g., layout of temple interiors) to supplement her descriptions. She is fluent in English, but one needs to listen carefully due to her accent, although it wasn't an issue for us. I would recommend her to a friend. My family and I had a wonderful tour of the Valley of the Temples in Agrigento with Sara. She was extremely knowledgable and we all felt that we learnt such a lot from her. Sara was very flexible and we were able to change our starting time to suit our schedule. I would highly recommend her tour. Sara was wonderful! Very knowledgeable! We really enjoyed our tour. She was very helpful. We would highly recommend the door with Sara!!! TOUR GUIDE RESPONSE: I'm really happy to know everything went well. I wish you all the best in your life! Sara is an exceptional guide and gave a tremendously interesting and informative tour of Valley of Temples in Agrigento. Very highly recommended for her knowledge of the Valley and region's history, culture and architecture. A great private tour. Two hours was the perfect amount of time to see all of the temples. Thanks Sara. Sara gave us an intelligent, thorough 2 hr tour of the marvellous Valley of the Temples yesterday. All of this was done in a patient, affable manner. 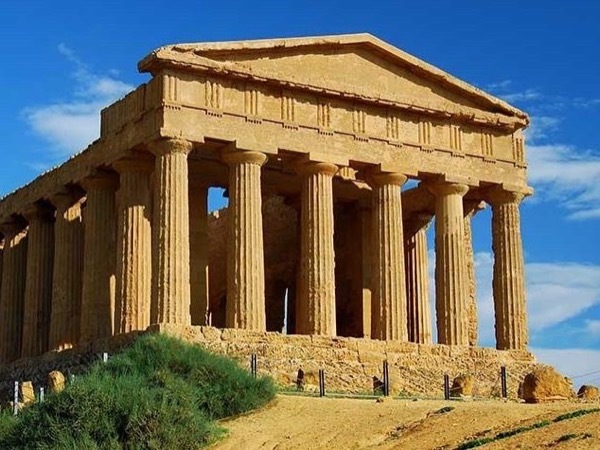 Sara is quite knowledgable and added a great deal to our appreciation and understanding of the Valle dei Templi site at Aggregento and to the place in Sicily's history played by Greek civilization. In addition, we especially appreciated the flexibility in scheduling that she offered to us when our plans had changed, making it very difficult to meet with her at our originally scheduled time. Well paced and very informative tour. Sara was extremely knowledgeable and exuded passion in describing the Temples and key artifacts in the historical Museum. Rating 5/5. You will be very pleased to have Sara as your guide. Sara was a wonderful tour guide. Even though we had difficulty finding her originally she was very patient and guided us through the streets of Agrigento. Sara was extremely knowledgeable about all of the tour highlights and her suggestions of places to see and eat where very good. Sara made the valley of the temples come alive with her explanations and stories. Truly a wonderful experience. TOUR GUIDE RESPONSE: I thank you for the wonderful time spent together. It was really very nice meeting you! Sara is a pleasant guide and knowledgeable about her bussiness and is one time. Sara was great, we thoroughly enjoyed our tour - thank you! Sara provided us wth an excellent tour! Lots of detailed information, presented in a very down to earth understandable manner. She greatly enhanced our enjoyment of the Valley of the Temples. Sara's English was great and she provided excellent historical perspective as well as answers to every question we asked, even the ones that were not, strictly speaking, historical. We are a family with two teen-aged boys (as well as Mom and Dad) who are very interested in ancient history and culture. I strongly recommend her as a tour guide for the Valley of the Temples. Thank you, Sara! Sara is a delightful guide - extremely knowledgeable and interesting. She answered all of our questions and patiently accommodated the photographers in the group. We are delighted that we chose Toursbylocals and would happily use this company again and wholeheartedly recommend Sara! TOUR GUIDE RESPONSE: Thanks a lot Gitelle for your kind comment. I was happy to work with enthusiastic travelers as your group! Sara was marvelous. We had terrible weather the day of our tour but she quickly adapted it to the timing of the rain . We still felt we got to see it all without missing anything. Her suggestions for lunch and dinner in Agrigento were perfect. Very well organized and informative. Sara did a great job providing a good overview of Agregento Parc in just two hours. I appreciated her schematics explaining the various points of interest. I highly recommend her services. Sara was a perfect guide! Please do not hesitate to contact Sara for your tour of the museum and the valley of the temples at Agrigento. She met us at the museum and gave a very informative overview of the artifacts. Then we followed her to the temples and she conducted a private tour with a delightful and information packed discussion as we walked. Her English is excellent, she was punctual and her tour was everything it promised to be. Sara was thorough, knowledgable and pleasant. We learned a great deal from her. TOUR GUIDE RESPONSE: Thank you Martha It was a real pleasure working with your nice family! Very knowledgable and interesting. I would highly recommend her. TOUR GUIDE RESPONSE: Thanks a lot Michael. Enjoy your journey in Sicily! Sara was a wonderful guide to the Valley of the Temples: very knowledgable about the history and a genuine enjoyment in showing me the treasures of this place. I consider myself very fortunate indeed in having spent a afternoon with Sara, while English was as excellent as her scholarship. TOUR GUIDE RESPONSE: Thanks a lot Martha. It was really nice meeting you. I will remember what a nice afternoon we spent together! We did a private tour of the Valley of the Temples and the Archaeological Museum with Sara in April 2014. Sara, a local from Agrigento, was an excellent guide. She spoke clear English and was very knowledgeable and passionate about the temples and the site. My husband usually gets quite bored with the museum side of things, but Sarah expertly took us through the main highlights of the museum without dwelling on every piece of pottery or giving overly long explanations. Fascinating tour, highly recommend!! Sara was fabulous! I am a camera buff so she was very patient and helpful. Her knowledge was incredible. (I just wish I had recorded her on my smartphone.) We had to rearrange our day and she rolled with the punches. We decided to drive ourselves around the island so guides like Sara made the trip much better. I felt that the tour was well worth the cost and look forward to using local guides in the future. Sara was a wonderful guide, very friendly, knowledgeable, and answered all our questions. She especially did a great job of maneuvering around big groups and in the museum knew her way around well enough for us to see the highlights without getting bogged down as there were a lot of works there. We really enjoyed our day out with Sara, first the temple site, then the museum and finally Agrigento city. It was really fascinating. We toured with our three children - 5, 12, 14- and they also enjoyed themselves. Needless to say, Sara knew the answer to every question and her passion for Agrigento and it's history was clear. Sara was terrific. She corresponded clearly in advance of our tour and was waiting at the meeting point as planned. Her tour of the Valley of Temples and museum was perfectly adapted to our family of adults with younger children. Sara is highly knowledgeable and speaks excellent English. Her use of pictures in a book to demonstrate certain features or drawings of the what the buildings would have looked like really brought the ruins to life. A must see historical site, we highly recommend Sara! TOUR GUIDE RESPONSE: Thanks a lot! Travellers like you, so interested and enthusiastic, let really us, guides, make the most of our work.